Yowza. That’s a big picture! Those Peeps are kinda freaky, aren’t they? Last year, Kate noted that the Easter Bunny gets slighted on the whole leave-out-milk-and-cookies-for-Santa thing, so we racked our brains for some appropriate, er, rabbit food. Naturally, I suggested some carrots. Ew, mama! He won’t leave us ANY presents if we give him carrots! She did have a point. So, we came up with these semi-homemade treats. 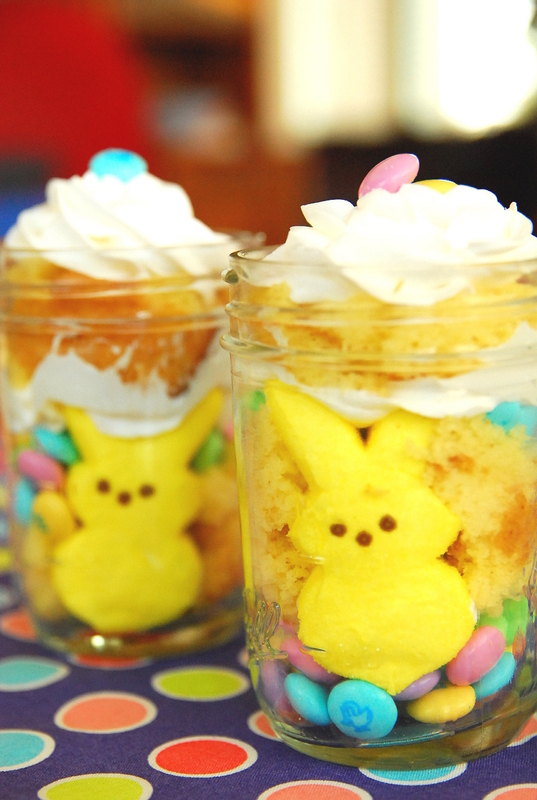 Yellow cake mix, whipped frosting, M & M’s and sweet yellow Peeps all hop in pint-sized jars to make these adorable trifles. We think they’re guaranteed to make the Easter Bunny leave extra big baskets — if you can make them last until he gets there. I let the kids assemble these, so they’re not exactly perfect. You can make them prettier if you want, but we figured the Easter Bunny would know if I did them all. Prepare cake mix as directed. Cut half of cake into 1-inch cubes, if you're being neat. (I let the kids just break it up with their hands). We only needed half the cake, so go ahead and eat the other half. 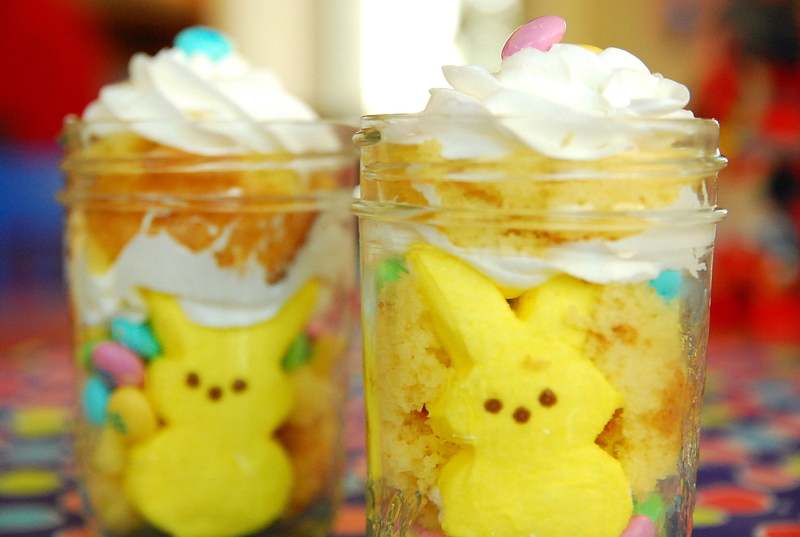 Place one Peep bunny in the jar; add cake cubes behind and around it to support it. Add layer of whipped cream and M&M's. Repeat.